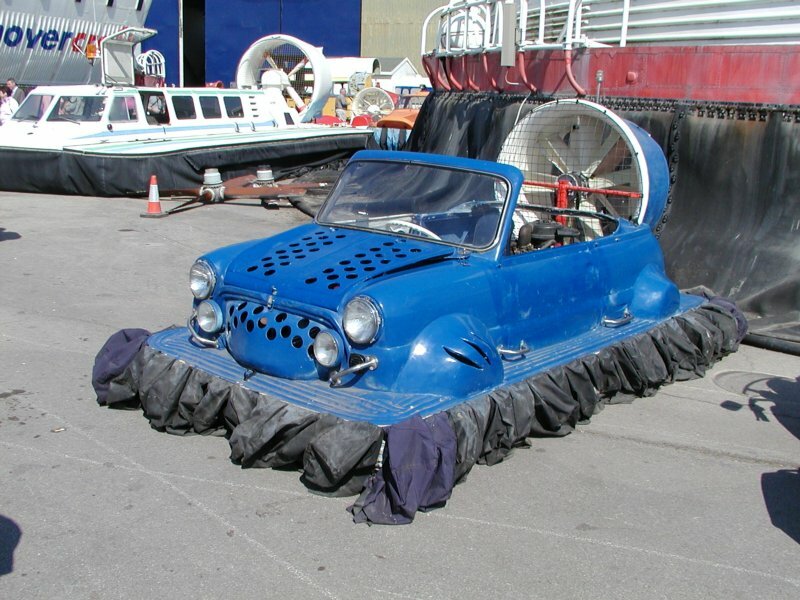 "What looks like a Domino shell has been turned into a hovercraft. In the front a Briggs and Stratton engine provides lift, whilst a Citroën 2CV engine drives the propulsion fan at the rear. The machine can be seen at the Hovercraft Museum, Lee-on-the-Solent." we used a rotax KEC125 for lift and a Fiat 126 for thrust on our build back in 85. After a very, very wet winter, I used a Rover V8 for lift on an 8' X 20' "Low Ground Pressure" fertilizer spreader. I had to have wheels to maintain a constant forward speed and to cope with undulating ground, so I used a WV engine and box, which also powered the spreader. It worked after a fashion, but I never overcame the problem of weight transfer as the load reduced. I worked much better as a sprayer because I had a tank either end, but then the drawback was that the water had to be taken to the sprayer in the field, not the sprayer to the water.